"Babe Ruth knocked out, 7/5/24. Nationals salvage split of doubleheader as Ruth crashes into wall (Yankees 2, Nats 0; Nats 7, Yankees 2). 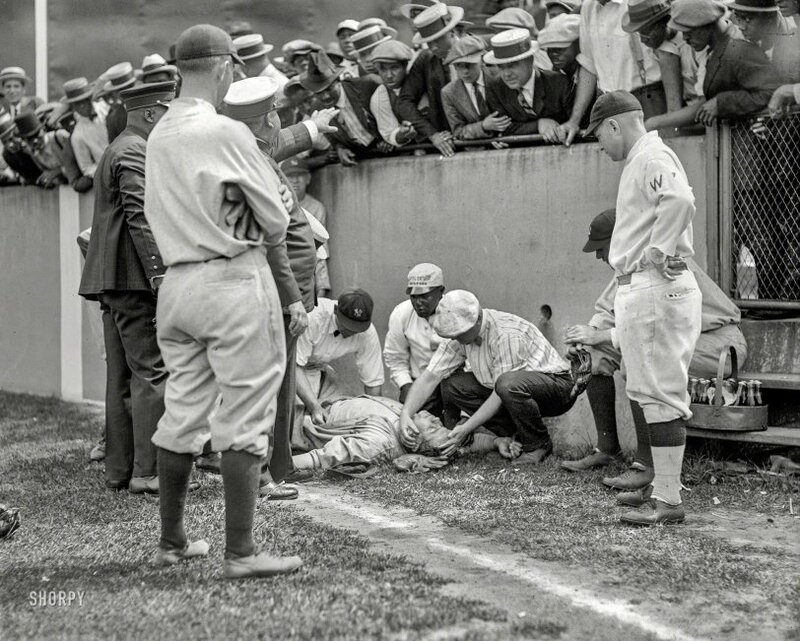 Babe Ruth was knocked unconscious after he ran into a concrete wall at Griffith Stadium, Washington, D.C., while trying to catch a foul ball on July 5, 1924." View full size. Submitted by DaveA on Mon, 05/21/2018 - 3:09pm. There was not even a mention of this incident in the following day's game report filed in the Washington Star, but there was a photo -- the same one we see here. The caption reveals a few nuggets. "This shows how completely Ruth was knocked out when he crashed into the concrete barrier of the right field pavilion chasing Judge's foul in the fourth inning of the opening contest. After being revived by trainers Al Woods and Mike Martin of the Yanks and Nationals respectively, shown administering to him, the Babe hobbled back to his post and carried on." I would be shocked if they didn't at least try to grab a bottle of pop from the vendor's hamper. Submitted by DaveA on Mon, 05/21/2018 - 2:55pm. 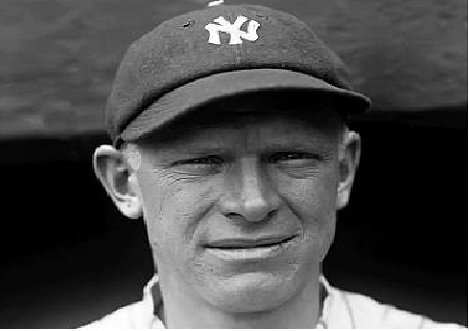 He may be nearly invisible under the outstretched hand of the big man in charge, but the perpetual squint gives away Yanks CF Whitey Witt, not one of the bigger names of the Bronx Bombers but certainly a regular. He also played it cool, finding the shady spot under the onlookers as it all played out...but as the high that afternoon only hit 78 maybe he didn't need to. That's seems pretty mild for D.C. in July. Submitted by Dag on Mon, 05/21/2018 - 12:43pm. I have seen many pictures of Babe Ruth playing and there is even some film but have never seen this one. My dad played college ball in the late 1930's and he had a glove that looked like that. The gloves of today are about twice the length of the fingers. I remember playing catch with my dad and I got to use that glove one day, it was tough. The babe was about 29 years old in this photo, he ended up playing 22 years 1914 - 1935. I believe the man on the left is Clyde Milan, he was the player/manager of the Washington team. Submitted by randersonabq on Mon, 05/21/2018 - 12:12pm. 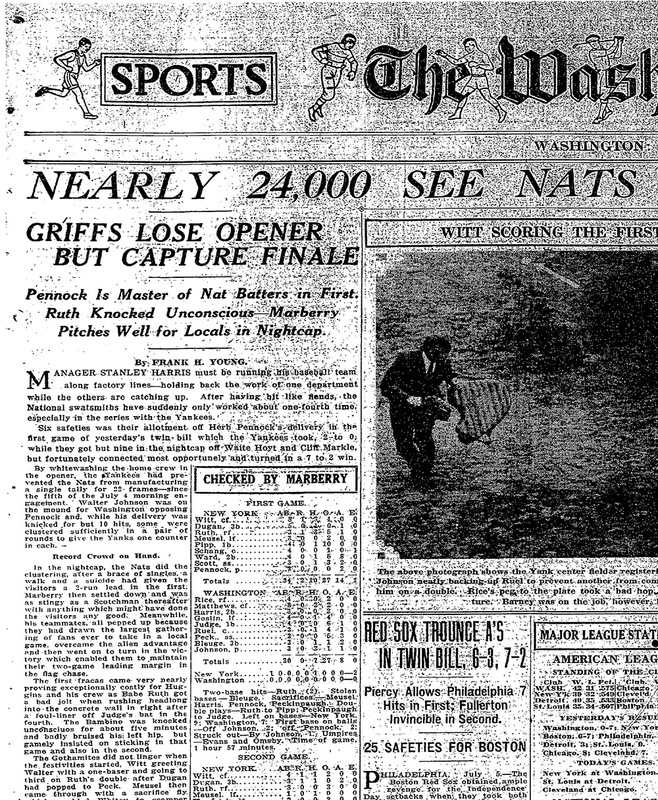 The Washington Baseball team in 1924 was the Senators. They later became the Minnesota Twins. Submitted by Commishbob on Mon, 05/21/2018 - 11:00am. Not a bare head in the bunch, and some pretty sweet hats among 'em. Submitted by DaveA on Mon, 05/21/2018 - 10:16am. Ruth is clearly out cold in this photo, and in modern times concussion protocol would kick in and a player in this state would be removed from the game. Ruth played right field (according to retrosheet.org) for both games, was not pinch hit for, and was so "hurting" the next day that he promptly went 3-for-4 and swatted his 22nd homer of the season at Griffith Stadium. He was some kind of force of nature. Submitted by Okeh on Mon, 05/21/2018 - 5:37am. There is much of interest in this photograph. Note the Yankee staffer applying ice to the side of Ruth's head. The man crouched down with him in the middle wearing a cap that in part says "100% Pure" is a soda merchant, and to the right of the photo you can see his metal hamper full of pop and ice.